Todd is a dog person. I am a cat person. I have only met two dogs in my whole life that I liked. I was very hesitant to get a dog for several reasons. (Reasons: they can't go to the bathroom by themselves, you have to practically touch their poop, they can't be left alone for long periods of time, they can't bathe themselves, they drool, they bark, etc etc etc.) But since I love my husband, I decided to let him get a dog. I had a few stipulations of course; the dog couldn't be big since we live in a small townhouse, the dog should preferably be an adult and the dog should be fairly calm. 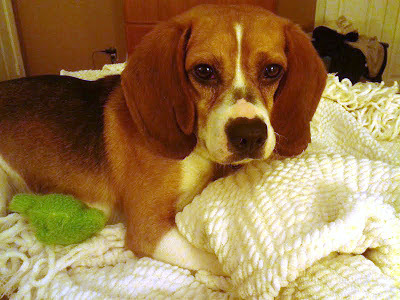 Two weeks ago (for date night) we went to a shelter and found a cute beagle named Ginger. She was five years old and very calm. She seemed perfect! She was a stray so the shelter had to keep her for five days in case the owner came back to claim her. We put in an application and of course, two days later, I received the call that she was claimed. How disappointing. Saturday morning we went back and found Manny, another beagle who was five years old. He was actually there when we were looking at Ginger but we passed him over for some reason. We decided to put in an application on Manny and I was able to pick him up on Tuesday (of this week)! We renamed him Banner, since he didn't know his name anyway. He is a five year old tricolor beagle. He has a lot of energy and likes to play and take walks. He is not trained with commands but he is housebroken. (He only went to the bathroom twice inside, once on Todd's clothes on the floor and once because he couldn't hold it in anymore during the night.) Banner is pretty indifferent to our kitties. The kitties have been watching him veryyyy closely. Banner is not a barker. He has only barked a few times when being put in his crate. He is always grunting and snorting like a pig though; it's very funny. His grunting and snorting is extra loud right now because he has a cold and is all congested. Silly dog. Banner also likes to lick my blankets. A lot. The sad part about all this is it turns out that I am allergic to dogs. We were anticipating that one since I had an allergic reaction to Todd's parents' dogs. I am fine with Banner if he stays out of my face and if I don't touch the dog and then touch my eyes. We will just need to keep hand sanitizer in each room of the house! So that is the "dog" in the post title. Now for the "house". I picked up a weird wooden house with shelves at a thrift store for $2. At first I picked it up to make fun of but then I thought it might make a cute display for my new salt and pepper collection. So I brought it home and painted it white. It even came with a hook on the back to hang on a wall. Side note: Why collect salt and pepper shakers? They are small and inexpensive. Plus, Todd wouldn't let me collect antique phones. I am also pretty picky about my collection as I like selecting the shakers myself. Cute mushroom shakers from the Cracker Barrel. They were only .99! A wedding gift my grandparents got when they got married. Another one from my grandma. I guess that's it for now. We are pretty busy (and exhausted) getting everyone acclimated to Banner! We have a beagle so have a few hints. The blanket thing might be a separation anxiety. I don't know whether or not you have them but we use human herbal Kalms. We now have our dog in a cage in our bedroom at night so it keeps him calmer. They are very much a pack dog so hate being on their own. They can also be allergic to gluetin in most cereals. Our dog has to have a food that is potato & meat biscuit & if we feed him dog meat it has to be in jelly instead of gravy. They are great fun, love playing, walking and being part of the family but ours has issues when on his own. Our garden was destroyed by him! You won't have as many issues as your dog is older. The other thing to watch out for is Beagles hug. It's the only type of dog we know that does this and have spoken to other beagle owners and they have found the same. Some other dogs don't understand the beagle hug so can take offence. They are great fun. Good luck and enjoy!